Most-torturous-flight ever? Finally home, get to ride my bike Sunday! Do the math; 33″ inseam, 31″ seat pitch, 2 inches of my legs unaccounted for! 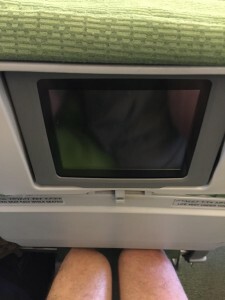 Most-torturous-flight ever? That would be the Addis Ababa to Dulles (DC) segment of my return from Tanzania. Instead of the direct flight on the way out, a mere 12.5 hours trapped in a metal tube while strapped to a narrow chair with only 31 inches of “legroom” (my legs are 33 inches so any concept of “room” by my math comes up negative)… The return consists of a 6 hour trip from Addis Ababa followed by a one hour refueling stop at 2:30am in Rome followed by 9.5 hours to DC. So you’re thinking, not so bad, breaking it up into two flights. Except that you’re stuck in the plane during refueling and not allowed to leave your seat, even to use the bathroom, due to some unforeseen danger posed by whatever’s going on in the dark. In the end, about 16 hours for one flight segment. Makes the 6 hour flight to San Francisco (that I’m presently on) seem like a piece of cake! Except that my tail end causes me to wince in pain every time I even-slightly reposition myself in the seat. No question Tanzania is an amazing place to visit, but next time I think I’ll fly to the east coast then row my way across the Atlantic to Morocco and from there ride a bike across the Sahara desert, finishing with a southern ride through Somalia, fighting off pirates on the way. This all may sound a bit odd, coming from a guy who has done round-trips to Manilla and Singapore for fun (yeah, I’m sometimes one of those “mileage runners” you might have read about), but Ethiopian 501 was almost enough to cure me of my flying habit. Next week I’ve got a short business trip to San Diego, no biggie, but early December in taking my daughter to Machu Picchu in Peru. Thankfully both trips will be largely on United, where I benefit from E+ seating (3 additional inches of leg room) and no flights over 6 hours. Oh, and the record of 13 consecutive curry-laden in-flight meals will likely be broken as well. Tomorrow morning (Sunday) I get back out on a bike. It’s going to feel terrible, after not riding for two weeks. And it’s going to feel AWESOME! Welcome home Karen & Mike.